Click Date Repeat Discounted for a Limited Time! If you haven’t read Click Date Repeat yet, click here to get the Kindle version for just $0.99! Most Recent 5 Star Review from Books, Chocolate and Wine! In her twenties, Chloe has everything sorted in her life, family, friends, career, her own home, everything that is except her love life, on the recommendation from a co-worker Chloe decides to give online dating a try. 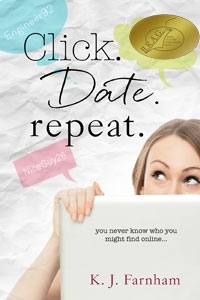 From the first hilarious and disastrous date, I thought that this was going to be a light hearted humorous look at online dating, but what you get is so much more. This felt more of an insight into someone’s life. Yes there were funny and disastrous dates, but I was also taken on the emotional roller coaster that coincides with dating. Chloe’s biggest problem was listening to her mother and two closest friends conflicting advice, often caring more about their opinions than her own. The book also raises so many issues, such as the stigma of online dating, how being perfect on paper does not always translate in reality, how we are all to some extent shallow and are concerned with looks. I can’t help but feel that most of the main characters were based on real people because of the way they are conveyed, they are not perfect, they all have their flaws and yet the group blends together to create something very real and easy to relate to. I was not ready for this book to end, and immediately looked to see if there was a follow up, I wanted to know more of the characters and what became of them. This book was both well written and well edited, if there were any editing flaws I was too caught up in the story to notice them. This book deserves a very easy 5 stars. No worry. The $3.46 Canadian is not a big deal. A cup of coffee and a donut and i’m sure your book is less fattening! I love the title of your book and am looking forward to reading it!